With cooperation from the National Museum of Modern Art, Tokyo, we conducted an optical survey on “Landscape with an Eye” pained in oil (1938, 102.0 x 193.5 cm) by Ai-Mitsu (1907-1948) on January 18. We took a full-color photographing and a reflection near-infrared photographing at that time. 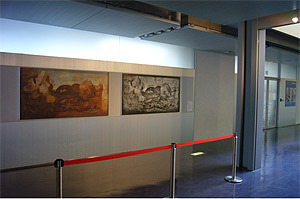 These two images are exhibited on the second floor of the Institute as an original-size panel. Following the above survey, we executed another survey using transmission near-infrared photographing on April 27. Taking the opportunity of the work’s restoration, we transmitted light from the back of the painting with the wooden frame removed. We were able to capture an image of the painting nearest to the canvas surface, i.e., an image of the work when it was created. This work is highly valued because of its unique expression in acceptance of Surrealism paintings in Japanese modern art. However, there are still ongoing discussions about how it was created and its motif. We must make a detailed investigation from now, using the images obtained by reflection and transmission near-infrared photographing. As long as we think of transmission near-infrared photo, we can recognize the depth of image that the painter had, and the traces that the painter left when he was trying to visualize the image as a real thing, in the form of a mysterious metamorphosis, which is different from an animal or a plant. 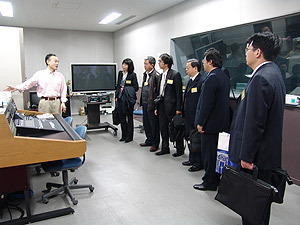 The Department of Research Programming is now preparing for the launch of the Tobunken version of the information search engine “SO-IMAGINE” using associative searching technology within this year. “SO-IMAGINE” is a search service that the National Institute of Informatics has developed and it is open to the public. 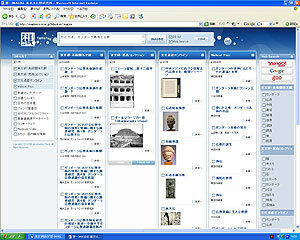 This completely new search engine allows us to designate the information you wish to know much more precisely from various genres of data sources, such as the library’s bibliotheca database, database of books in stock of bookstores and secondhand bookshops, database on cultural properties, encyclopedia and tourism data, and deepen the association based on the retrieved data. 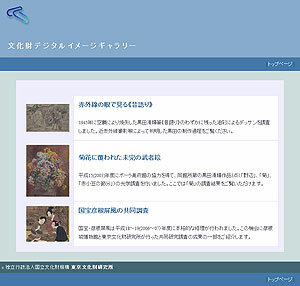 The search services of “SO-IMAGINE” combined with the independent database of the organization, such as the National Museum of Art version and the Tsubouchi Memorial Theatre Museum of Waseda University version, have already started operating. Similarly, the Tobunken version will be an independent search service by combining “SO-IMAGINE” with “Tobunken art-related documents”, “Tobunken Odaka Collection”, etc. We will make public the data on approximately 400,000 items on the “Tobunken art-related documents”, and approximately 2,000 photos on the “Tobunken Odaka Collection”, taken by Odaka Sennosuke who first surveyed Bamian, Afghanistan as a Japanese researcher. 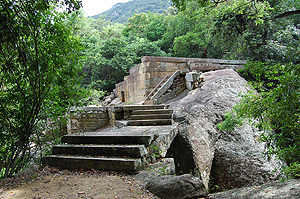 We hope that very useful data for studying cultural properties will be transmitted. as the database on artists/art-related persons and the database on art galleries. The former database contains the names of 19,947 persons and allows you to check details such as their pseudonyms, history of works on exhibitions and dates of death. The latter database includes 521 art galleries, and allows you to confirm the titles of the art gallery history, and whether there is any information on exhibitions. 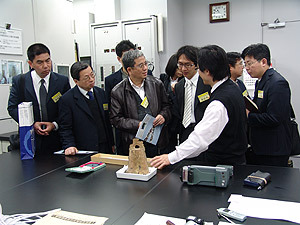 Among the materials donated by artists, art-related persons, art galleries and the Contemporary Art Document Center superintended by Mr. Sasaki Shigeo, the Institute stores thin catalogs, art gallery news, DM, flyers and newspaper articles in the artist files and art gallery files separately. The database we are now releasing to the public displays only whether or not there are any material files, and we plan to release the items of material to the public in sequence. See “Using Data Files” for how to read the materials. In April 2010, we added a Digital Image Gallery of Cultural Properties to the website pages of the Institute. At present, the gallery includes the contents of “‘Talk on Ancient Romance’ viewed with infrared eyes”, “Incomplete picture of warriors hidden behind chrysanthemum blossoms”, and “Joint research on national treasure Hikone folding screens” – all in Japanese only. With “‘Talk on Ancient Romance’ viewed with infrared eyes”, we made public the results of research on ‘Talk on Ancient Romance’ painted by Kuroda Seiki. This painting had been damaged in a fire during the air raids of 1945, but taking near-infrared photographs of it revealed some slight remains of the oil-painted ebauche. With “Incomplete picture of warriors hidden behind chrysanthemum blossoms”, we received cooperation from the Pola Museum of Art and made public the research results of an optical survey on three Kuroda Seiki paintings – “Field (Nobe)”, “Chrysanthemum” and “Sieving red beans” owned by the Pola Museum. With “Joint research on national treasure Hikone folding screens”, we introduced part of the results of a joint research investigation conducted by the Hikone Castle Museum and National Research Institute for Cultural Properties, Tokyo, during 2006 and 2007, in which the Hikone folding screens were repaired. The gallery plans to show “Old photographs of Nagoya Castle Keep Palace” and other articles. The ‘Research and Reports on Intangible Cultural Heritage’ volume 4 was issued in March 2010. This year volume includes the three reports which relate directly to the Convention for the Safeguarding of the Intangible Cultural Heritage: “Convention for the Safeguarding of the Intangible Cultural Heritage Now in Its Implementation Phase” by Mr. Miyata Shigeyuki, “Intangible Cultural Heritage in the Asia-Pacific Region, Classification of Items Listed on the Representative Lists and the Function of Specialized Institutions” by Ms. Matsuyama Naoko, and “Challenges of Safeguarding Intangible Cultural Heritage – Visiting various regions in Japan and Asia-Pacific countries” by Mr. Hoshino Hiroshi. The Convention for the Safeguarding of the Intangible Cultural Heritage went into effect on April 20, 2006. The understanding and handling of cultural heritage vary depending on the countries that ratified the convention because of the circumstances of each country, and so this situation is fraught with versatile and complicated issues. The reports show a portion of these circumstances. As with the previous volumes, the PDF version of all pages will be made public on our website. 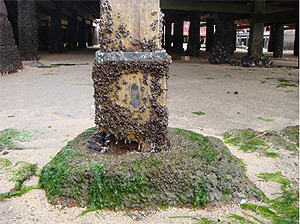 The Center for Conservation Science and Restoration Techniques is also examining the extent of deterioration of wooden buildings in the project “Study on assessment of influence of ambient environment on cultural heritage and countermeasures.” Among the wooden buildings subject to a severe outdoor environment, particularly the Itsukushima Shrine in Miyajima-cho, Hatsukaichi City, Hiroshima faces stern conditions, such as harsh weather and the influence of seawater. It is affected by intense UV rays, wind, rain, seawater and waves, and was also heavily damaged by gribbles and shipworms under the sea. We are now studying how to prevent the wood from deteriorating in this situation, and how to restore the deteriorated wood and what restoration materials to use. Therefore, we are conducting physical tests such as a strength test, curing test and exposure test in various forms at the local site. In this way, we are investigating the optimum techniques to use. We hope that the results obtained by such examinations will be adopted for other wooden buildings. 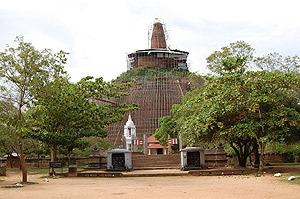 From April 4 to 13, we were dispatched to Sri Lanka by the Ministry of Foreign Affairs, and conducted a field survey on the approach status of protection of cultural heritage such as archaeological sites, along with external specialists. 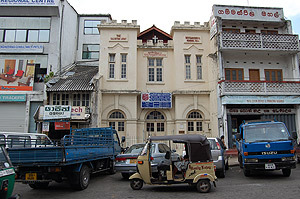 In Sri Lanka, the civil war which lasted for a quarter of century just ended last year, and new development is expected in the field of protecting cultural heritage, a field that has been neglected because of the country’s financial difficulties. The major purpose of our survey was to collect basic information so that Japan can examine what cooperative assistance is possible via UNESCO and other bodies in the future. In this survey, we visited local sites and interviewed the relevant organizations about the current status of conservation in world heritage registration places and the future outlook. We also conducted a field survey on multiple sites which will likely be registered in the future. The results made us realize that in many cases various plans exist but there is no prospect of them materializing and there are many serious problems in terms of the structure for protecting cultural heritage including insufficient specialized human resources. We would like to positively participate in investigating how to proceed with concrete cooperation.